Hey all! Any word on how the ice is out on Lake Lida? I want to try and get the kids out there one more time this yr! Thanks in advance for any ice update anybody can give for Lake LIda! PM me if you'd like. Thanks! Nobody out there to give you a report....even on weekends only a couple groups and they may not be on this Forum...I've been out to similar sized lakes in same area...last Sunday drove out in my SUV 18" of good ice but with this rain we had last night and still today they are a messy....I'll probably be walking out tomorrow...if I go. I have been surprised with the lack of guys out chasing crappies...I've done better since end of Feb up till now than I did the entire season before that point...and best is yet to come IMO. Bison was out there two days ago had a good 15-18 inches. Access was heaved as it normally is this time of year. I took my wheeler and trailer and got over it with no problem. 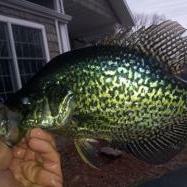 I'm also really surprised about the lack of fishermen out there chasing panfish. Not sure why but there's been barely anyone out even when I drive around looking at lakes. Maybe the really warm spell a few weeks back scared a lot of people away?? I was on pelican last Monday I'm sure the ice on lida is the same I'm glad I had my extension on my auger used most of it to get through the thing about it is there are two layers of ice with water between them you will probably need water proof boots. Sorry I didn't see the post till now. Lot of guys still been going out there but I don't have any first hand knowledge of how the conditions really are. If its like the lakes I have been on the accesses are junk and if you can get away from shore 200 feet you are solid.